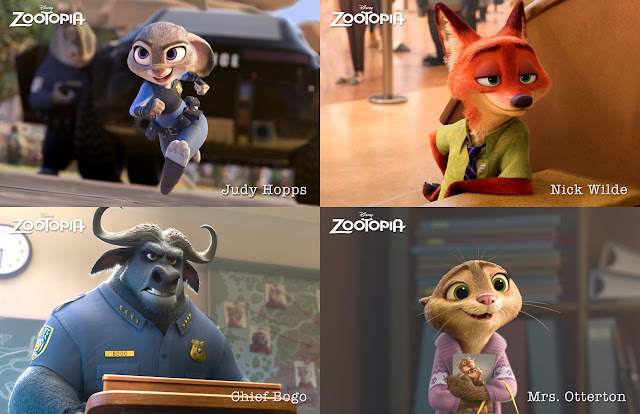 Chief Bogo (Idris Elba), a cape buffalo and the stern (yet goofy) head of the Zootopia Police Department. He is reluctant to add Judy Hopps to his squad of hardened rhinos, elephants and hippos. 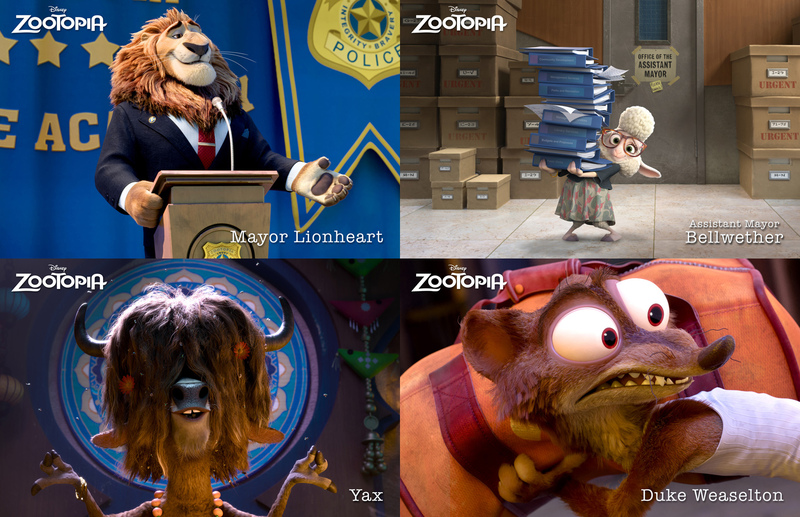 Mrs. Otterton (Octavia Spencer), a desperate otter who turns to Officer Judy Hopps for help in solving her husband’s mysterious disappearance. Assistant Mayor Bellwether (Jenny Slate), a sweet sheep with a little voice and a lot of wool, who constantly finds herself under the foot of the larger-than-life Mayor Lionheart. Duke Weaselton (Alan Tudyk), a small-time weasel crook with a big-time weasel mouth, who tries to give Judy the slip during a police chase. Yax the Yak (Tommy Chong), the most enlightened, laid-back bovine in Zootopia. When Judy Hopps is on a case, Yax is full of revealing insights. Benjamin Clawhauser (Nate Torrence), Zootopia Police Department’s most charming cheetah who loves two things: pop star Gazelle (Shakira) and donuts. From his reception desk, he greets everyone with a warm smile and a helpful paw—covered in sprinkles. Flash (Raymond Persi), the fastest sloth who works at the DMV (that’s Department of Mammal Vehicles). Bonnie Hopps (Bonnie Hunt), Judy’s mom, and Stu (Don Lake), Judy’s carrot farmer dad. They are worried about Judy moving to Zootopia and the untrustworthy big-city mammals who live there—especially foxes! Finnick (Tommy Lister), a fennec fox with a big chip on his adorable shoulder. 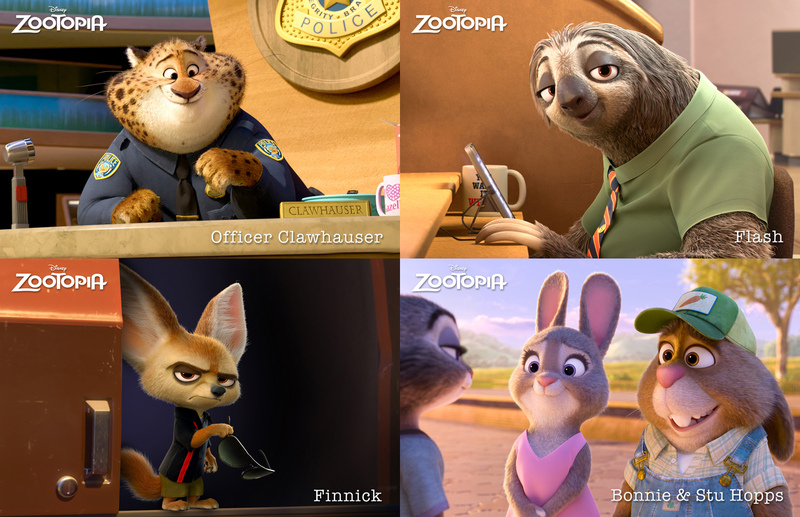 Opening across the Philippines on Feb. 17, “Zootopia” is distributed by Walt Disney Studios Motion Pictures International through Columbia #ZootopiaPH.